Dr. Joyce King-McIver’s expertise focuses on school-age language development and the assessment and intervention of oral and written language disorders in this population. She is particularly interested in interventions for written language and the role of the speech-language pathologist in literacy. 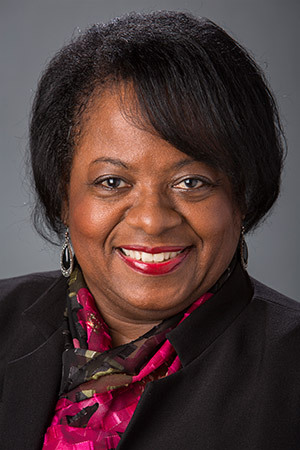 Dr. King-McIver serves as the Coordinator of Clinical Services for the UWM Speech and Language Clinic. She supervises graduate students in the on-campus clinic, teaches courses related to assessment and intervention for children and adolescents with language disorders, as well as provides administration of the clinical education and services provided by graduate professional students. Her research and professional collaborations have focused on the incorporation of Self-Regulated Strategy Development (SRSD) for narrative writing in inclusive classrooms with children who have Autism Spectrum Disorders. Certificate awarded for completing 13 hours of training on Effective Writing Strategies for Struggling Writers using SRSD at the HILL for Literacy Center in Waltham, Massachusetts. Award for Continuing Education (2014) American Speech-Language-Hearing Association (ASHA). Travel Award Recipient (2012) Symposium on Research in Child Language Disorders (SRCLD). Award for Continuing Education (2007) American Speech-Language-Hearing Association (ASHA). Award for Continuing Education (2005) American Speech-Language-Hearing Association (ASHA). Award for Continuing Education (2002) American Speech-Language-Hearing Association (ASHA). Frances B. Starms Soror of the Year Award (2000) Alpha Kappa Alpha Sorority, Inc.: Chapter Honors. Spirit of AKA Award (1998) Alpha Kappa Alpha Sorority, Inc.: Chapter Honors. Member of the Year (1989) Alpha Kappa Alpha Sorority, Inc.: Chapter Honors.